I love the "Terminator" movie series (apart from "Terminator 4"). Arnold Schwarzenegger makes the perfect machine cyborg, with his sculpted body and stiff acting. Linda Hamilton's Sarah Connor character is truly a warrior female, who will do anything to protect her future progeny. But there was always something that bugged me about the films' concept. Actually there were two, but the second would serve as a spoiler for my own novel so I'm not going to discuss that here. It's the other bugbear I have with the movies, that became the starting point for me when I was thinking about my novel "Time After Time". In fact it even lies behind the novel's title. In "Terminator" a cyborg assassin is sent back through time to kill Sarah Connor to prevent her giving birth to her son that will become the future leader of the Resistance to the rule of the machines. The Resistance also manage to send one of their top men Kyle Reese back to protect her. This is where the human brain goes into meltdown, trying to pick all the logical flaws and frays that accompany these assumptions. Let's say the Terminator is successful in his mission and kills Sarah Connor so she never gives birth to her son. The future therefore ineluctably proceeds on to the triumph of the machines and the extinction of the human race. Then what happens/happened to that version of the future where the machines were so up against the rack against the Resistance that they needed to send back a Terminator to kill Sarah Connor? It happened in the narrative once, so it can't be uninvented. Yet the future now has no John Connor and no potent human Resistance. Second, Reese comes back and not only protects Sarah Connor, but both impregnates her and dies in the earth of the past in the line of fire. So John Connor makes it to the future, but with the DNA of a father who should be one of his troops in the Resistance and indeed in one version of history was, but yet Reese died back in the past and didn't ever make it back to the future to take up his 'normal' place in the timeline. How can he have been sent back from the future when he's already died in the past and not lived to make it into the future in the first place? Presumably time splits between two versions here, but I'll pick this up a bit later. Also, before Reese was sent back, he is fighting alongside John Connor. Yet that John Connor should not even be alive, since it is only Reese going back in time and making Connor's mother pregnant that gives life to John Connor in the first place... Does your head hurt from all this yet? Mine did! The usual logical way round these paradoxes is to suggest that time is not singular, but that there are many versions of reality, with differing outcomes and narratives. These are often referred to as parallel universes and are tied into Quantum Theory to explain the differing probable and possible outcomes even from the same set of circumstances. Reese says that the current reality he and Sarah are embroiled in with its implications for the future, "one possible future", but then feebly proffers that as he "doesn't know tech stuff" he can't explain it in any more detail. Well parallel universes only get us so far. So there are many possible futures and even possible veering off of the present. 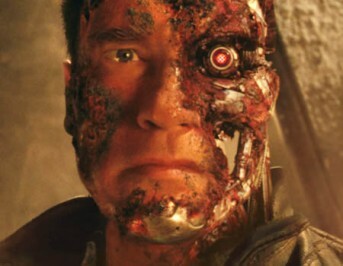 In some versions the Terminator will be successful and the machines will rule the future. In other versions Reese and Sarah foil the Terminator and John goes on to lead the Resistance to victory over the machines. In a coiling of time back on itself, the strange goings on of Reese siring John, or Reese dying in the past before he can return to the future to be sent back to the past are just bumped over into the next version in an infinite loop. But then if the machines win some futures and the humans win others, what does it matter? You have a chance to live in the future where man prevails, or you are unlucky and end up in one of the timelines where you become extinct. But both exist. Just hope and pray you end up in a lucky timeline. Not that you are conscious of any other version of reality. But it means the human race can never be wiped out, because in some realities it persists. Equally mankind cannot ever fully extirpate the machines, because elsewhere in a parallel universe they still rule the roost. Parallel realities show the entire spectrum of outcomes, they can never lead to a single, ultimate one. Hence the title of the book, "Time After Time". I do try and deal with these paradoxes of time and make clear that my assassin's mission has to be successful in every version of reality, for him to wipe out the presence of the 'mother of the future' from ever existing. But chance, different timings and the like mean that there will always be other outcomes of his mission, that it can never yield the same result time after time after time. What my book does, is draw a parallel between the mission of getting up close to a stranger in order to assassinate them, and getting up close to seduce them. The same variables of timings, chance, circumstance, missed signals, misread intentions and the like all impact on the outcome. The book is less about assassination, but more about the countless number of outcomes when a man and a woman are in the same place, at the same time and trying to get close to one another. And the humour derived from the tiny differences that can alter the outcome so radically. I also draw lightly on "The Butterfly Effect" from Chaos Theory, which can be summarised as the possibility that the mere flapping of a butterfly's wings can change a whole weather pattern the other side of the world through a linked change of circumstances that build up on the back of that one tiny event. Again, I feed this principle into that panoply of words and signs a man and women display during the initial time of their suit. And finally we return to the concept of time and its paradoxes. Time is just a human concept that helps us pattern our perceptions (night/day, the seasons, the movements of the planets, shadows, etc). It has no existence beyond our conscious mind. The Big Bang theories state that there was no Time before the Big Bang itself and that it only came into being at that point. Matter came into being and started moving away from the Big Bang explosion, travelling through Space at a velocity measured in time and also that the material of planets started to age from their formation. Einstein came along and merged time with space to form our fourth dimension of Spacetime, an oblique concept for most of us who can only conceive of things in the three dimensions of space, because that is how our minds have been taught to perceive our world, horizontal, vertical and depth. Three dimensions is a sufficiently good model for us to negotiate our way not only through life, but also to be able to send rockets to explore planetary bodies way beyond our atmosphere. Yet it is this fourth dimension of Spacetime, or any fourth dimension of conceptualising the arrangement of matter (as offered by recent theories like String Theory or multiverses), where our brains start to malfunction and logic breaks down, because we simply don't have the mental apparatus to enable us to think in four or more dimensions. And it is these failings in our perceptual and conceptual apparatus that allow the paradoxes of time travel to remain unsolved and to stay at the heart of films like "Terminator" and books like "Up The Line" and "Time After Time". As Sarah Connor says towards the end of "Terminator" - "A person could go crazy thinking about all this stuff". Did I already mention that I love the "Terminator" film series?